What is authentic leadership? Does it require a leader to express his or her true self even if that true self is less than ‘wonderful’? How do followers know the difference between real and fake leaders anyway? What happens when cultural expectations of what constitutes authenticity clash? Can a leader be ‘authentic’ within virtual contexts? International scholars and practitioners from the fields of philosophy, sociology, psychology, leadership, business and the arts address these and other provocative questions, often with surprising results, in this cutting-edge update of the theory and practice of authentic leadership. 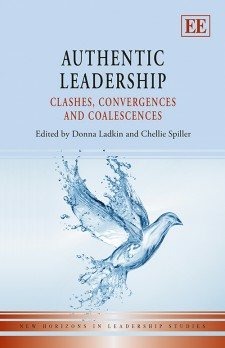 This book updates, critiques and extends the theory of authentic leadership in a way that will prove invaluable for academics and graduate students in leadership studies. Human resource practitioners or individuals who are responsible for leadership development within their organizations will also find plenty of invaluable information in this important book. Click here to receive a copy of the Introduction to authentic leadership chapter. While two-dimensional ‘square intelligence’ dominates much of conventional leadership, wayfinding offers an expanded sphere intelligence approach that transforms the conventional approach. Inhabitants in the sphere’s world have a far greater ability to see the whole and obtain a well-rounded perspective.